Fermentation has been used since before man could write. There is evidence that neolithic people were taking advantage of fermentation. So, for over seven or eight thousand years people have been using the natural process of rot to save foods for later. You see, there is not any significant difference between rotting food and fermenting food. Fermentation is controlled rot. When you leave vegetables in your refrigerator crisper for any extensive length of time uncontrolled fermentation will occur and before you know it the fruit or vegetable will become a mass of slimy goo. The wild bacteria that make this happen live on the fruit when it is alive in the field, but just like your body can protect itself from all of the germs that live on and in it, the fruit, when alive, can do the same. Remove it from the plant and the process of degradation begins in earnest, the fruit can no longer utilize the defenses of the plant and the bacteria turns it back into raw materials for future life. When you eat certain foods fermentation even occurs in your body. The gasses that come out of you after eating a dinner of ham and beans are a good example. There are starches that you can’t use in beans, but they are used by a strain of bacteria that lives within your intestines, and as they eat the starch they produce methane. We all know methane by it’s smell. Controlling fermentation and forcing a fruit or vegetable to rot in just the right way is also and ancient art. The tools, likewise, are ancient. The method is simple and requires not a single modern convenience. You will need a vessel, a food, water, salt, a way to keep out bugs, and time. It must be warm enough to promote growth, but not so warm as to halt it. The vessel you use can be any waterproof vessel, but if you use metal the acid that the fermentation makes will leach metal into it, harming the vessel and changing the taste of the food. Don’t use a metal vessel. You can use plastic, but I hate plastic–which is a topic for another post. Don’t use plastic. You can use pottery–it is good because it blocks the light. Trying to ferment in the sunshine will be futile, because good fermentation occurs in the shadows. You can use glass, I use a very large (3 gallon) glass jar to make kombucha. I have also used quart or half gallon mason jars–which are nice because when you are done fermenting you can just pop a mason jar lid on them for long term storage. 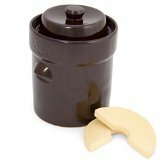 My new favorite is the fido jar with a swing top lid. 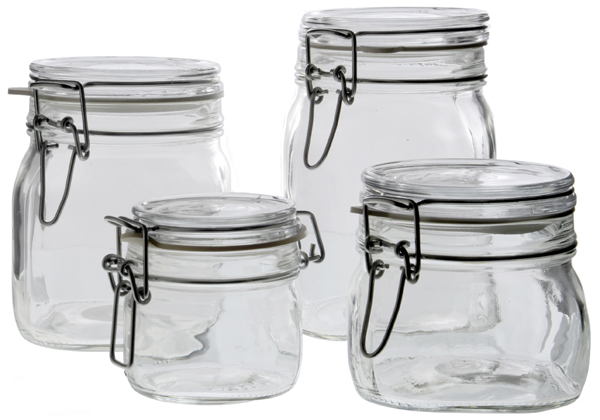 Basically, any jar that you can put a light cover on to keep bugs out can be used to ferment in. You don’t need anything fancy, new or expensive. You can ferment any food. Cheese, yogurt, cream cheese are all fermented milk. Kombucha is fermented tea. Sauerkraut is fermented cabbage. Kimchee is fermented salad. Vinegar is fermented wine or cider. Pickles are fermented cucumbers. Fruit, eggs, beans, and meats may all be fermented. Pepperoni is fermented meat, for instance. The basic process we are discussing is best for vegetables and beverages. The water you use has a couple of special requirements. It can’t be tap water. Tap water will contain chemicals that your water supplier puts in it to keep it from containing harmful bacteria. The chlorine and other chemicals can’t tell the difference between a bad or good germ, it will kill our fermentation bacteria, too. If you take water out of the tap, leave it on the counter for an hour or so. The chlorine will evaporate. If you want to speed the process up, boil the water, which also drives all of the other gasses off of your tap water. The water cannot be too hot when you use it though, because heat kills bacteria. Putting water over 100 degrees on your cabbage will ensure that you will never get sauerkraut. Salt is added to our ferment because the bacteria we will be harnessing doesn’t mind a slight briny solution, but the bacteria that would turn our vegetables into goo can’t live in brine. We can’t use just any old salt, though. Table salt is not pure salt. Morton salt pours in the rain because they add starches to it to absorb water and keep the salt from clumping. We don’t need any of that in our ferment, so we use coarser salts, like kosher salt (what I use) or sea salt. People like sea salts because they contain other minerals besides sodium chloride. It doesn’t help us ferment, so other minerals are optional. Another ‘bug’ that can invade, even past our cheesecloth seal is mold. If there is food riding above the surface of the brine then mold will take hold. Sometimes mold will just grow on the surface of the water. You can just scoop this mold off. If it doesn’t change the color of the water then it hasn’t gotten beyond the point of no return. If it doesn’t stink you can save your batch–and by stink you will know it when you smell it. Kraut has an odor as it ferments, and it is not unpleasant. Rot smells like it sounds, rotten. If you use an airlock or water seal jar mold cannot get in, either. I have found it easiest to make kraut and vegetable ferments is easiest in quart jars that have been modified to use a brewer’s airlock. That is a one dollar mason jar, with a 7 dollar ReCap, a fifty cent plug and a fifty cent airlock. If we double the expense it is eighteen dollars worth of materials, that you can get right now on Amazon.com for 25 dollars. Must be buying convenience. Mix up a batch of brine, the recipe is this: into four cups of chlorine free water dissolve 2 tablespoons of sea salt. Mix until dissolved. Load a mason jar with small cucumbers that you have cut the blossom end off of. Pack them in there so they won’t float so easily. Fill the jar with your brine. Leave some room for bubbles that will form on the fruit as it ferments or it will overflow into your airlock. If you aren’t using an airlock put a glass or stone weight on the fruit to hold it under the surface. Such weights are sold online. Seal your vessel against bugs. If you are using a giant pickle crock you can just put a towel over it. Cheesecloth works on smaller vessels, and a mason jar with a cap loosely affixed will be sufficient for canning jars. 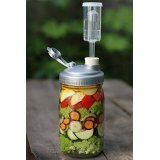 I use a tight lid and and airlock for vegetables. Now you wait. In three days you will be able to taste the sourness of good bacteria eating the starches and sugars in your vegetables. In a week, if its warm enough in your house, your ferment will be done. Now you can move the food into it’s permanent storage. The water will be alive with probiotics. If you pressure or bath can at this point you kill the bacteria, but the ferment will keep then indefinitely without spoiling. If you do not pressure can then you have to keep your ferment cool. Root cellars would work, or you refrigerate them. I have canned my kraut and fermented peppers. They retain all of the wonderful tastiness and nutrition, all they lose is the probiotic. This entry was posted in Health, Living and tagged fermenting, pickling, sauerkraut. Bookmark the permalink.